Earlier in his poker career, WSOP success came quick for John Hennigan as he won gold bracelets in a 2002 $2k HORSE event ($117,320) and a 2004 $5k Limit Hold’em tournament ($325,360). Since then, Hennigan’s career has had plenty of near misses in his pursuit of bracelet number three, including a second-place finish earlier this summer ($319,993) and a third-place effort in last year’s $50k Poker Players Championship. The latter is quite noteworthy here because Hennigan finally got over the hump by winning the 2014 WSOP $50k Poker Players Championship and $1,517,767. He survived a field of 102 of the world’s best players and battled back after falling to the short stack in three-handed play. Brandon Shack-Harris, who’s had an excellent WSOP with 4 top-four finishes, was a thorn in Hennigan’s side during both three-handed and heads-up play. But after hours of grueling poker, Hennigan was finally able to finish off Shack-Harris ($937,975) and increase his career winnings to $6,268,701. There wasn’t much time to celebrate, though, since Hennigan ran to his seat to get started in the $10,000 Limit Hold’em Championship after winning. You’ve probably heard about a poker pro or two who struggled after Black Friday. But few pros could attest to the hardships that Jesse McEuen suffered through following April 15th, 2011. Once financially secure with three houses and $400,000 to his name, the successful online poker pro’s life took a huge downswing when his bankroll was lost on an online poker site for good (probably UB or Absolute). From here, he sold three houses that he owned and moved to Mexico to continue grinding at the biggest poker sites. Unfortunately, financial distress and poor play caused him to lose what money he had left. So in a last-ditch attempt to reclaim his poker career, McEuen grabbed his dog and the last few thousand dollars that he had and headed for Vegas. Lucky for him, he ran into John Kabbaj, who won a gold bracelet this summer and had went through his own hardship recently (a nasty divorce). Kabbaj felt bad for McEuen and decided to stake him in the 2014 WSOP. Both Kabbaj and McEuen are celebrating now because the latter topped a 714-player field to win a $1,500 Ante Only NL Hold’em event and $212,093. Aside from getting some cash to build his bankroll again, McEuen will no doubt receive the shot of confidence that he’s been sorely lacking ever since Black Friday. The 31-year-old poker pro from Bellevue, Washington beat a field of 991 players to win the $270,992 top prize. 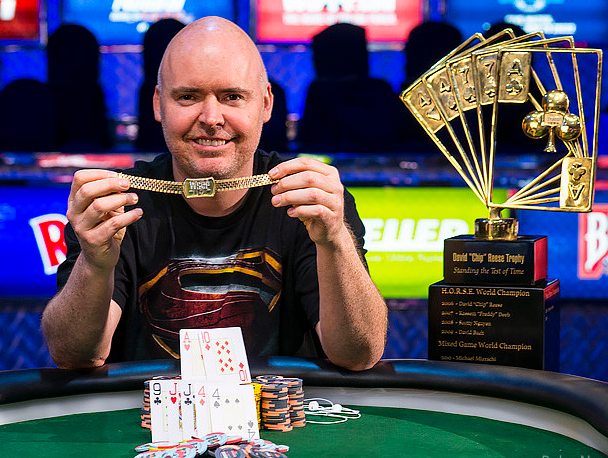 Some of the notable pros whom Patterson survived to win his first bracelet include Scott Clements (2nd, $167,686), Jeff Madsen (4th, $76,150) and Tom Schneider (6th, $42,142).